Patricia Gloria Goddard (born 23 December 1957) is an English television presenter and actress best known for her morning talk show Trisha, which was broadcast on a mid-morning slot on ITV before later being moved to Channel 5. She has been based in the U.S. since 2010, when she started working on Maury as a conflict resolution expert. 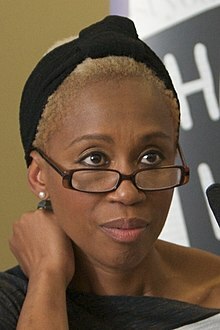 She hosted a U.S. version of her own talk show, named The Trisha Goddard Show, from 2012 until it was cancelled in 2014. Patricia Gloria Goddard was born in London on 23 December 1957, the daughter of a Dominican mother and an unknown father. She did not discover that the white man who raised her was not her biological father until after her mother's death, though he was the biological father of her three sisters. In her late 50s, Goddard set out to find details of her biological father after a genetics expert insisted that her skin colour made it almost impossible for her to have a white father. As a child, she was educated at an independent school for expatriates in Tanzania, after which she returned to England to attend primary school in Heacham, Norfolk. She then joined Sir William Perkins's School in Chertsey, Surrey, which was a voluntary controlled Church of England girls' grammar school at the time. Goddard's early career as an air stewardess led to travel writing for magazines and then, after settling in Australia in the mid-1980s, a new career in television. She worked there as a television presenter, most notably on ABC's The 7.30 Report, and also as a host of the children's program Play School. She was later chairperson of the Australian Government's National Community Advisory Group on Mental Health. In 1998 after returning to the United Kingdom Goddard became the host of an ITV flagship daytime chat show, the BAFTA-winning Trisha, produced by Anglia Television. She launched her own independent television production company, Town House TV, with former Director of Programmes and Production for ITV Anglia, Malcolm Allsop. In September 2004 Goddard left ITV to join Five in a new programme titled Trisha Goddard, which made its TV debut on 24 January 2005. Similar in style to her old show, it focussed on relationships, families in crisis, and reunions. The show was produced by Town House Productions. In the early stages of the show, it was observed that repeats of her ITV show continued to achieve higher ratings than her new programme on Five. In January 2009, Five announced it would not be renewing her contract, for financial reasons. Goddard has made a total of five guest panellist appearances on ITV's Loose Women, three appearances in 2003 and two further appearances in 2014. Goddard has appeared in satires of her television programmes. In 2003, a specially-shot clip of her show appeared in the ITV religious fantasy drama The Second Coming. In 2004, she filmed two short scenes for the romantic zombie comedy Shaun of the Dead. Both scenes were filmed on the set of Trisha. In 2004, a facsimile version of her show was featured on Season 3, Episode 1 of the show "Fat Friends" where she interviewed the "slimming group" of the main characters, and where Betty unintentionally revealed her secret that she had given up a baby at the age of 15. The episode showed the director telling Trisha to stay on Betty and wait until she revealed her secret. Her show was also featured on a Comic Relief episode of Little Britain where the character Vicky Pollard met up with her long-lost father. For a What Not to Wear Christmas special aired on 22 December 2004, Goddard was given a fashion makeover by Trinny Woodall and Susannah Constantine. She appears very briefly in the 2006 Doctor Who episode "Army of Ghosts" in a parody episode of her own show entitled "I Married a Ghost". Goddard appeared as a guest on the BBC's The Kumars at No. 42 and was also the guest host for an episode of the second series of The Friday Night Project, for Channel 4. Goddard also has her own talk show on Liverpool radio station City Talk 105.9. Goddard also made an appearance on Who Wants To Be A Millionaire? raising up to £75,000. She also made an appearance on the BBC show Shooting Stars in 2010. Also in that year, she began to make occasional appearances on the American talk programme Maury as a consultant and a guest host. On 20 October 2011, NBCUniversal Television Distribution announced that it would launch an American version of her eponymous talk show to start in September 2012. On 1 April 2014 it was announced that this version of the programme had been cancelled after two seasons. In August 2017, Goddard guest hosted Channel Fives' The Wright Stuff for five episodes. She has been a regular panelist on Channel 5s Big Brothers Bit on the Side since 2016. In February 2018 Trisha appeared on an episode of BBC One game show Pointless celebrity edition, also appearing Johnny Vaughan and Toby Tarrant, the episode will be aired later in the year. ^ a b c "Trisha Goddard on her quest for her birth father". ITV. 21 June 2017. Retrieved 4 August 2018. ^ a b Holmwood, Leigh (9 January 2009). "Channel Five drops Trisha Goddard". The Guardian. London: Guardian News and Media. Retrieved 10 January 2009. ^ Television: Wednesday 22 December – The Times. Retrieved 13 September 2007. Wikimedia Commons has media related to Trisha Goddard. This page was last edited on 5 March 2019, at 00:16 (UTC).